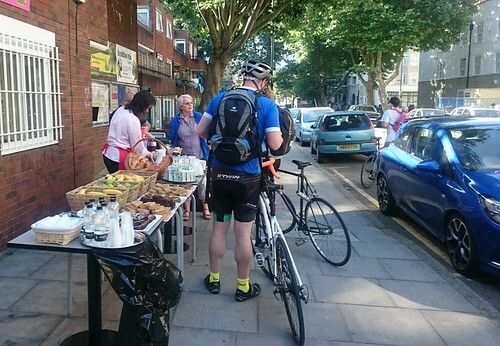 Camden Cyclists set up their annual bike week Wednesday breakfast in Ossulston Street outside the Somers Town Community cafe. 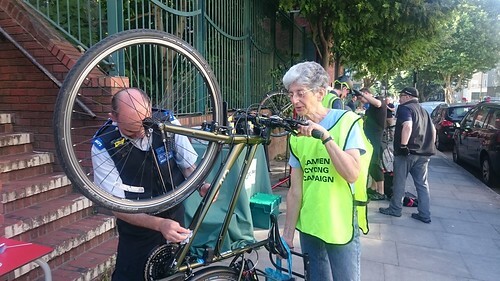 Helen Vecht organised the event, making arrangements with the café, negotiating with Paul Davis over bringing Camden’s materials and organising the Dr Bike and Bike marking. 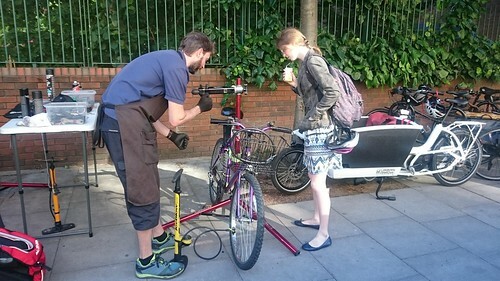 James Brander delivered our banner, A-frame and numerous other things in his little trailer. As usual, Helen managed the information stall and collected names of people who want to keep in contact. 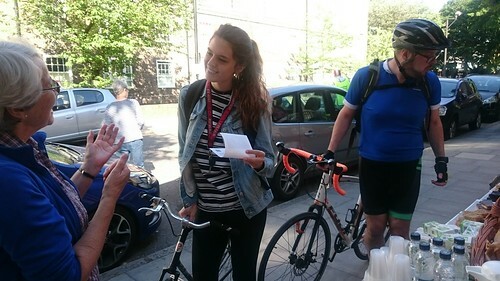 She was helped by Sean who advised people on routes and gave out the usual maps. Unfortunately the new ones were not available in time. Meanwhile, George and Steven stood in the road with a tempting tray of croissants and brownies as well as LCC joining cards and flyers for our Ride All Round Camden ride next Sunday. 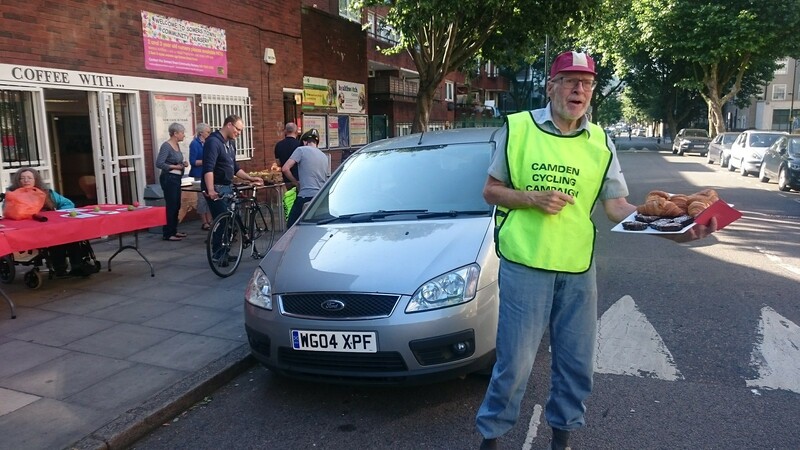 Next year, it would be good to get a few of the parked cars removed for the event. The photo on the left shows Helen and Sean at the table with the nice red table cloth. The photo on the right shows George in action. Paul Davis’ team have given up their electric van, using instead a pair of electric cargo bikes, one of which can be converted to a stall. 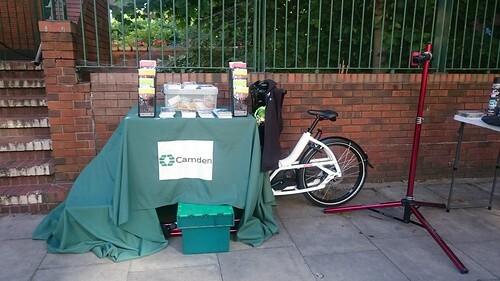 The photo on the left shows the electric cargo bike converted to a stall while the other can be seen in the photo on the right behind Sam Parkes. 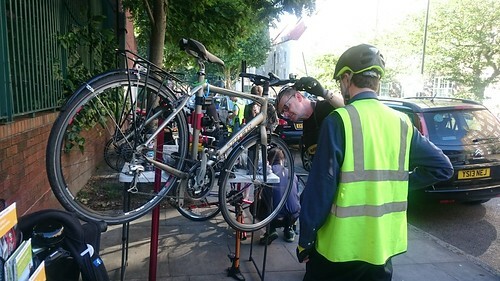 The photo on the left shows Richard Riddle in action as Dr Bike and the photo on the right shows Angela’s bike being marked. 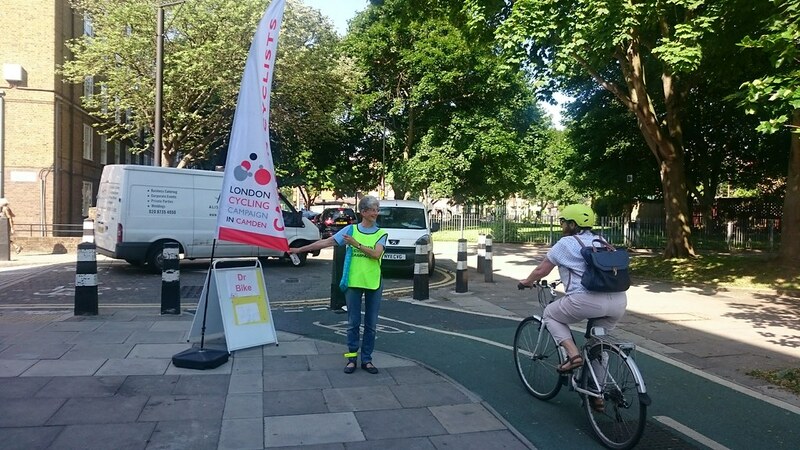 Angela took up her usual position with the flag banner calling out to passing cyclists to encourage them to stop for: ‘a croissant, Dr Bike, bike marking, maps… or if you’re in a hurry take a ‘doggy bag’ for your elevenses. She had already been doing this for at least an hour when I took the photo but was managing to smile at each one. We were fortunate to have perfect weather at an event that seemed to be enjoyed by all who came. 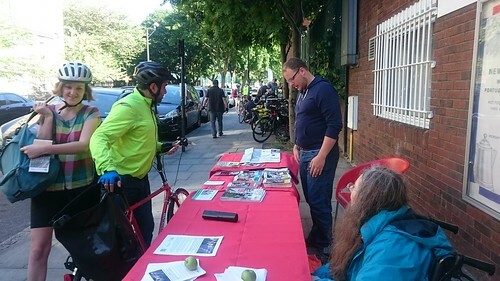 Thanks are due to Helen for organising the event and to Mary and Susan who came as usual to help with speaking to people who came to the stall as well as Sean, Steven, George and specially Angela for coming down from her new abode in Haringay. 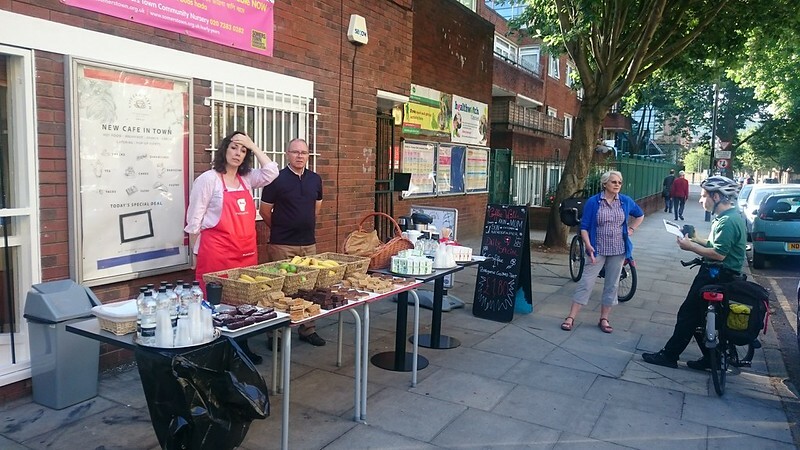 Finally, thank you to Paul Davis for supporting the event as usual.